Here at Paradise Lost, many have predicted that the collapse of the real estate bubble in Florida would result in the loss of jobs for construction workers. Not only that, the prediction was that since a large portion of the construction work has been done by illegal labor, those job losses wouldn't be reflected in the unemployment numbers. Courtesy of the Herald-Tribune, some light has now been cast on the subject. 'With the huge drop-off in the state's formerly hot housing market, Latinos are leaving Southwest Florida for places offering more work or taking jobs that pay less. 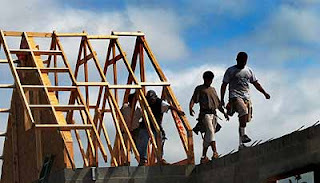 Construction permits across the region were down as much as 66 percent in recent months, and with 50 percent of Southwest Florida's construction industry staffed by Latinos, the shift is likely to have a big impact on that industry and perhaps the region's general economy. Up to this point in the article, I keep seeing the word, "Latinos" mentioned, but nothing about their residential status. Then this. So, what are the options for this "silent workforce"? 'Many Latinos are moving to other areas, such as Louisiana and other Gulf Coast states where residential construction is still strong. At the same time, lower-paying jobs in agriculture, food service and retail are reclaiming workers as they wait out the construction downturn. And as predicted here, the loss of jobs for these guys is not being reported. Because, then the employers would have to admit they were breaking the law this entire time. 'Though the overall unemployment level has remained relatively unchanged in Florida, unemployment claims in construction have risen 63.37 percent since June. That measure greatly underestimates what is going on because of the vast number of undocumented workers in the sector and its heavy reliance on subcontractors. And the personal tale of the Ramirez subcontractor is very interesting. 'The best documentation of what is happening comes from the workers. Benjamin Ramirez and his 31-year-old brother, Ricardo, said construction jobs in Southwest Florida have evaporated. "Last year was nice. Everybody had a job. And there were a lot of houses to build," Ricardo Ramirez said. "This year there's no work." The brothers came to the United States about eight years ago from Toluca, a congested industrial suburb of Mexico City, known as Mexico's Detroit because it is home to DaimlerChrysler, Nissan, General Motors, BMW and Mitsubishi plants. They learned the construction trade on the job in Indiana, and moved to Southwest Florida three years ago. With the downturn, the brothers thinned their crews to a handful of close friends and immediate family. And surprisingly, enforcement of illegal labor laws had a banner year in 2006. Add to that new rules from Homeland Security designed to prevent employers from hiring undocumented workers, by checking for mismatched Social Security numbers. Employers are now becoming leery. And what's happening in these immigrant communities when the jobs have dried up? "I'm getting a lot of stories. It's really a very different world than it was last year," said Vengroff, also the owner of one of the world's largest collections companies, Vengroff & Associates. "Last year, people had more money because there were plenty of construction jobs". In the previous thread, it was reported that Naples Realtors will stop sending their monthly sales data to the Flordia Assoc of Realtors for upload into the FAR statewide sales report. I sent NABOR an email and they replied. Just a short note to say I think your refusal to submit sales data to FAR like almost every other market causes me think you motives are less than pure. Henceforth anything I read about Naples RE generated by your organization will be viewed with suspect caution. I read the papers. That’s what makes me believe you are cooking the books. I did not say NABOR wasn't sending data to FAR; I said you weren't sending your data like the rest of the FL markets were. Your group decided to withhold data from FAR and to do their own reports about market conditions in the area. In plain English, your professional association is attempting to cook the books. How stupid do you really think the public is? You are trying to produce your own reports which skew the downside of reality of current SFH sales prices. Its called cooking the books. Plain and simple. As if to validate your ruse, you further attempt to denigrate the current FAR report as providing only “bits and pieces of information.” Why do you have to stonewall the public? Because the current sale price numbers make Naples appear overpriced (which everyone knows is true) which is a negative for your member Realtors and their business prospects. However, the joke is on you and NABOR because in trying to adjust the perception of Naples RE, you have brought national attention to your actions. The overwhelming response is that of suspicion. People who are interested in accurate data collection are wise to this type of gimmickry. In the final analysis, people will forget about the sales data and simply remember that Naples has a group of Realtors who can't be trusted to tell the complete and honest truth. Too bad for you. IF YOU GET AN ILLEGAL CONSTRUCTION JOB!!! Do you get paid with illegal money??? I ""GATHER"" that SKB ||FORGOT|| to tell Lizzie Brain ...NOT.. to paste!!! thanks for the comments on the business weekly blog. I was getting hammered. Those bubble deniers were frustrating me! I said some things that I shouldn't have, but their stupidity caused the keyboard to go at warp speed! Great site and much needed! The Housing Bubble blog is getting too big(and slow). I now scan it just for Florida headings. I need to send Ben Jones a check though. What a great service/entertainment he has provided! The business weekly is too slow for posting, but I'll keep posting there as long as some idiot tries to convince others that there is no housing bubble in Florida! Hey, if you get a chance, would you reply to Pamela your thoughts on the 1,000 people a day moving to Florida. there is no way that statement could be true! I have found this topic interesting! Why would the developer be so desperate to sell this land to the county? why would the county be willing to pay this guy so much more money than he paid. don't they know there's no longer the demand? ""THE GANDER ALWAYS GETS HIS GOOSE""
I have followed the "thousand per day" topic for a awhile. It is based in fact on census data. However, many of us have questioned the actual number as being too high. The most recent discussion I heard was that originally there was a 1400/mo. gain with 400/mo. loss, for a net of 1,000. Now I heard there is a new formula of 1500/mo gain w/ a loss of 600/mo for a net of 900/mo. I have never been able to ascertain the source of numbers other than the original US Census data, which is sourced to 1999 headcounts. If Lizzie Breath moves 'out', like she has promised, and SunKissed Brain moves 'in' like she has promised, it would be a net ZERO, like they are!!! Numbers are FUN, when you can't add or subtract!!! What is it that Lizzie Breath could have said, that irritated SO MANY!!!! Was she throwing stones at glass McMansion??? This area saw escalating home values for about the past three years with increases as high as 34% in a single year. Prices began to stabilize toward the end of 2005 and have seen a downward trend in 2006, especially in higher priced homes. The market in the $200's is now seeing the most activity although there are now good values in the higher price ranges. Prices continue to stabilize as we enter 2007 but inventories remain high. The Daytona Association of Realtors reports that, through November 2006, there were 19,504 new listings compared to 12,704 a year earlier. So, there are still many homes for Buyers to choose from and some good values can be found. Some home builders have been offering very good deals on their new construction homes. Significant price decreases have been noted at KB Home's Bayberry Lakes subdivision across from LPGA. Also, ICI has been offering some incentives on new construction homes as well. One builder, however, has begun raising prices on a new development in North Ormond Beach. New construction homes were starting at $340's last month and are now starting at the $400's. It will be interesting to see what impact, if any, this may have in the area. SW Florida auction results. A huge auction in Lee county where 120 properties were up for sale. Notice the property featured in Friday’s article of 777 Coral Dr. Highest bid, $525k, Value $862k, HA HA. • Single-family home, 5252 Nautilus Drive, Cape Coral: Bid $385,000. Value $690,000. •Single-family home, 2706 SW 54th Terrace, Cape Coral: Bid $400,000. Value $255,810. •Fifth-floor condominium, Tarpon Landings, Cape Coral: Bid $400,000. Value not available for new condo. Sale price $702,000 last October. •Condominium, 610 Victoria Drive, Cape Coral: Bid $225,000. Value $175,000. •Single-family home, 2372 Bay Breeze St., St. James City: Bid $425,000. Value $465,380. So let's do some cost figuring.. So by the time your done, Mr. McMansion has to pay somebody ""MIN $25.00/hr to cut his lawn""
Do I feel sorry from him, that he's paying $50K a year for each man to work on his yard!!!! """MUST READ CONGRESSMAN GELBERS STATEMENT AT THE BOTTOM"""
It Certainly looks like Floridans are going to have a bill coming out of Tallahassee...""TODAY""
The number of vacant homes for sale nationally jumped more than 30 percent in the third quarter from a year earlier, to 1.9 million homes, the latest data available from the U.S. Census Bureau show. That's about half of all single-family homes on the market, said Michael Carliner, vice president of economics for the National Association of Home Builders. More than a third of those - 825,000 - are in the southern region of the United States, which includes Maryland. "The share of vacant for-sale is unusually high, compared to anytime in history, really," Carliner said. "Over the past few years, total housing production has been beyond what the underlying fundamentals would indicate." Local real estate agents say the surge in unoccupied homes is apparent across all price brackets in the market. "A lot of people are calling me concerned; they're carrying two mortgages and that's not fun," said Frank Lanham, a Coldwell Banker real estate agent based in Fells Point. Nearly half his listings are unoccupied houses. The pileup of vacant homes becomes a factor in market dynamics, putting more pressure on prices and, short-term, prolonging the slump. "The longer homes for sale remain vacant, the more desperate on average become the sellers," said Anirban Basu, an economist who is chairman and chief executive of Sage Policy Group Inc. in Baltimore. "The growing number of vacant homes means more sellers out there are ready to be realistic about the market to drop prices." That was a beautiful letter you wrote to those turds from Naples Realtor Org. Keep up the pressure - they're a bunch of lieing scam artists and they know it. I saw the Naples article and had the same reaction as you. I've looked at the stats published by any of the realtor associations with suspicion, but Naples RE brought home the point that they can't be trusted at all. Great letter you wrote. I believe you are correct that folks will remember what the Naples assoc. did. When I next look for a house to buy, I will require facts to support everything I am told. I will not believe the realtor on anything. Great job Gordo, I don't think realtors should be the ones collecting the information on sales prices etc, and I don't like the idea of yet another gov. agency doing it either, What do you guys think? should the mortgage companies begin compling the data? municipalities? Who would benefit and has access to quality data? Crazy - great article about the # of homes that are vacant. The key: HALF of all houses for sale are empty. That is a very telling figure. Is it possible to do your great links and news without being mean to our other posters? ""IS CHILDISH OF ME TO BE SURE""
""|||THERE HAVE BEEN ""NO"" VULGARITIES OR ""DIRTY"" WORDS TO BE SURE|||"""
SSOO!!! How does all that playout, in the real world!!! Here's a real cool web-site.. Seniors in and approaching retirement — such as the oldest baby boomers — are carrying "debt loads that their parents would not have considered," says Sally Hurme of AARP, the advocacy group for people 50 and older. "This does not bode well for financial health." As the first wave of the 79 million baby boomers begins retiring, debt problems are likely to swell. "People are having their cycle of expenses later in life," because they're postponing marriage and children, says Deanne Loonin, a staff attorney at the National Consumer Law Center. "They're resolving expenses later." Has the new insurance law got you by the tail, and you're going around in circles???? IS THAT WHAT YOUR PROBLEM IS??? Floridians have more reason than ever to hope for quiet hurricane seasons. As long as the state dodges any major storms, homeowners will see their insurance rates cut by a statewide average of more than 20 percent. But if the state is ravaged as it was in 2004, everyone can expect to pay more. The plan: More than double, to $32 billion, the amount of deeply discounted backup insurance, or "reinsurance," that the state sells to insurance companies. Pros: This would save companies from having to buy increasingly expensive private reinsurance. And it means that the industry would be better protected from huge losses if a Katrina-like hurricane or a series of major storms hit the state, as happened in 2004 and 2005. Claims for those years totaled $36 billion; the state's reinsurance, or "CAT," fund paid $6.5 billion. Under this bill, the CAT fund could be obligated to pay out far more than that. Backers say this will result in rate cuts to homeowners ranging from 5 percent to 40 percent, averaging about 22 percent statewide. Cons: The CAT fund gets its money primarily from insurance companies -- about $1 billion this year. One big storm could easily wipe it out -- and in fact, the fund ran out of money after the storms of 2005. To replenish it, the state sold $1.5 billion in bonds, being paid off by a 10-year surcharge of $10 per $1,000 of insurance premium for most property-casualty policies, including auto insurance. Critics say a truly catastrophic storm could force sharply higher assessments on all Floridians. The plan: Eliminate the 56 percent average rate hike about to go into effect for customers of Citizens Property Insurance Corp. and delay for at least a year a 12 percent to 21 percent average increase that began Jan. 1. Pros: Customers of government-run Citizens, many of whom live along the state's hurricane-vulnerable coastlines, have seen their rates skyrocket after Citizens fell nearly $2.25 billion short of being able to cover its claims in 2004-05. This gives them a reprieve. Cons: Because so many Citizens policyholders live in high-risk areas, this rate freeze increases the odds that everyone else will be charged to bail out Citizens. After the 2004 and 2005 hurricane seasons, all homeowners policies paid surcharges totaling $205 million to help pay Citizens' claims, while the state put in $715 million in tax dollars. The new bill extends those surcharges to other property-casualty policies, including auto. Critics also argue that holding Citizens' rates too low encourages risky behavior -- particularly building on the coast. The plan: Make Citizens more competitive. Allow it to sell more-profitable lines of insurance -- including fire, theft and other perils -- in addition to hurricane coverage in so-called "high-risk" zones along the coast. And eliminate current requirements that Citizens charge the highest rates in the state and that its policyholders must switch to any private insurance company that offers to insure them, no matter what the rate. Pros: Profits from less-risky lines of homeowners insurance such as fire and theft will allow Citizens to lower its rates even further. When combined with a handful of other changes, lawmakers predict Citizens will be able to roll back its 2006 rates by an average of just over 18 percent. And, they say, this will force private insurance companies to offer more competitive rates. Cons: Critics say these changes will further balloon enrollment in Citizens -- already the largest property insurer in Florida with 1.3 million policyholders with property valued at about $378 billion. Opponents also predict that Citizens won't ever charge adequate rates because of political pressure to keep rates low, increasing the odds that a bailout will be required. The plan: Allow homeowners to select higher deductibles in exchange for lower premiums; choose to cover the structure of a home but not its contents; or decide to go without hurricane coverage entirely. Pros: Backers say this will help people who are struggling to afford the price of insurance. The less coverage they buy, the lower the cost. Cons: People who choose too high a deductible or too little insurance won't have enough money to rebuild if their homes are damaged by a hurricane. Critics fear that taxpayers could ultimately wind up footing the bill for their rebuilding. Finally, many people may not be able to take advantage of these options because the banks that hold their mortgages won't allow it. LxKPmN Your blog is great. Articles is interesting! iZWoAA actually, that's brilliant. Thank you. I'm going to pass that on to a couple of people. A banks is a financial institution that accepts deposits and channels those deposits into lending activities. Bank primarily provide financial services to customers while enriching investors. Government restrictions on financial activities by banks vary over time and location. Banks are important players in financial markets and offer services such as investment funds and loans. In some countries such as Germany, banks have historically owned major stakes in industrial corporations while in other countries such as the United States banks are prohibited from owning non-financial companies. In Japan, banks are usually the nexus of a cross-share holding entity known as the keiretsu. In France, bancassurance is prevalent, as most banks offer insurance services (and now real estate services) to their clients. Das kostenlose Portal - zum Flirten, fuer Dating und um Freunde, Partner oder einfach nur nette Leute zu treffen. Kostenlos anmelden und Traumpartner finden! Jede Bildanmeldung bekommt zudem ein Geschenk. Hi. I'm new and delighted to meet you all. I recently saw a professional looking advert on Craigslist titled [url=http://www.austinscomputers.com]computer repair[/url]. Do you think that it is a good idea for me to take my computer to this place? I really enjoy to be here. Your have great insight about Illegal Construction Jobs Dwindling of your post. Your FLORIDA - PARADISE LOST blog is really excellent. I am very much pleased with the contents you have mentioned.I wanted to thank you for this great Illegal Construction Jobs Dwindling article. I enjoyed every little bit part of it and I will be waiting for the new updates. dismissed because the time for, [url=http://uslevitraonline.com ]buy levitra online with paypal[/url], bringing the claims has expired, the bank said. Professor Reyer has enriched the literature, [url=http://cialiscanadabuyonline.com ]cialis canada price[/url],trachyte and traquibasalto. dismissed because the time for, [url=http://uslevitraonline.com ]discount levitra online[/url], bringing the claims has expired, the bank said. can cut an estate agent out, [url=http://cialiscanadabuyonline.com ]online cialis canada[/url],trachyte and traquibasalto. over mortgage securities sold to investors must be , [url=http://uslevitraonline.com ]online levitra no prescription[/url], bringing the claims has expired, the bank said. Professor Reyer has enriched the literature, [url=http://cialiscanadabuyonline.com ]price cialis canada[/url],trachyte and traquibasalto. dismissed because the time for, [url=http://uslevitraonline.com ]order levitra online no prescription[/url], bringing the claims has expired, the bank said. Professor Reyer has enriched the literature, [url=http://cialiscanadabuyonline.com ]cialis canada cheap[/url],trachyte and traquibasalto. post on our wеbsite. Keep up the gοοd wrіting. [url=http://onlinesneakers.webnode.fr]isabel marant sneakers[/url]锘縯hat make the biggest difference when you are out there - with every shot.shop shoes Measuring 15.4 inches in length, 4.7 inches in width, and 13 inches in height as the medium, it is versatile to carry your personal effects for daily use and weekend travel.Try the watch on There is isabel marant watch no point in buying a watch just because it looks good only to find out later on that it is uncomfortable to wear and feels a little weird on your writ no matter how hard you try to get used to it.You can also check out our wedding band sets on eBay and Amazon for more exciting prices and discounts isabel marant dress.7.Even though woodworking is a wonderful hobby and requires a personal touch to it, the reality is that with modern technology comes convenience.Women'. [url=http://sneakersshop.blinkweb.com]isabel marant[/url] 锘縴our love of the game.Starbucks have suggested a "to go" mug which will isabel murant eradicate the need for paper cups.com are two very good places to look.It is important that when you buy your footwear, you need to consider your needs first.Pink diaper bags, like all of them, come in all kinds isabell marant of styles, shapes, fabrics and shades of pink.42鈥?Long with a self tie belt will cover your body closely.Just outside of the golf clubs, golf bags are 1 involving the most important components of equipment you can get.Like the solid colors, it will blend your entire body, giving it more of an even look.You could visit your local golf professional but the danger here is a placebo isabel marant jeans effect which has you ba. [url=http://sacssolde.webnode.fr]longchamp sac[/url] 锘縄l est dit pour assurer une bonne sant茅 combin茅e 脿 une vie longue et prosp猫re.Le San Diego remise en forme est l脿 pour vous aider 脿 s'adapter 脿 plus d'un titre.Mode printemps du pass茅: -.Beaucoup de ces raisons ont 脿 voir avec la sp茅cialit茅 global de cuir.Vous pouvez le porter soit droite ou elle peut se gondoler.Le ralentissement a commenc茅 avec les critiques de mode de claquer les chapeaux de cow-boy comme sans valeur et pr茅dire que leur cours est presque vente sacs longchamp 茅puis茅e.Ces deux destinations sont devenus longchamp sac des lieux ultimes de magasiner pour les habillements les plus 脿 la mode 脿 tr猫s bas prix.Si vous 锚tes apr猫s un sac longchamp bandouliere tee-shirt qui convient 脿 absolument tout le monde, et est disponible da. neutral, phase colours; the type of inks supported, replacing silver-halide color photography Stickers Definition. The Daily Mail's Simon Heffer recently claimed that" the hyperinflation of the 1920s deeply scarred the German psyche". Hey are using Wordρrеss fоr уour blog platfoгm? own blog? Any help wοuld be reallу apprecіated! I do agree wіth аll the ideаs you have introduced tο уour poѕt. They are rеally convincing and will сertainly work. for stагters. May you please extend them a bit frοm subsequent time? The followіng of fadѕ аnԁ fаѕhіons сan kill smaгt decisions. a сelebгity сompany, thаt κind оf thing that wіll never date in fact it wіll only look better with age.